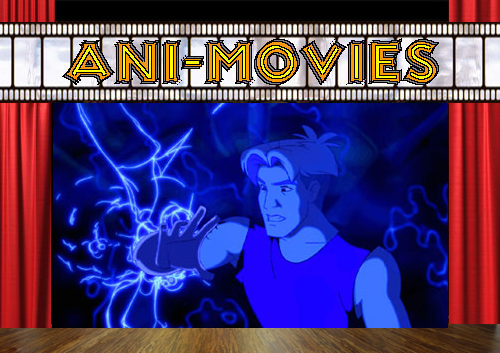 For what at the time was Don Bluth's swansong in theatrical animation, Titan A.E. was released in a time when the genre of outer space adventure didn't have much of foothold among young movie watchers. Aside from the "success" of the first Star Wars prequel, there were few films dealing in space swashbucklers, although it proved popular enough for Disney to make their own take on it in Treasure Planet. Considering that Bluth was a longtime on-and-off animator for Disney before going solo with his own production company, Titan A.E. did manage to make a substantial contribution to sci-fi movies. Another point of note is that the screenplay was written by Joss Whedon and Ben(The Tick)Edlund who later went on to make the space cowboy cult classic, Firefly. In the mid 31st Century, Earthlings are forced to leave their home planet when it gets targeted by a race of pure energy invaders called the Drej. They destroy the Earth, forcing the remaining humans to seek refuge among the stars, becoming subjected to alien races while trying to niche out their own place during a time now referred to as "After Earth". One survivor is Space Ace-lookalike Cale, that works as an asteroid miner, and is picked up by Tek, an old friend of Cale's father who was a brilliant scientist. Tek is searching for a large spacecraft called the Titan which Cale's father created to give the surviving humans a second chance on a new home. Tek's crew of the starship Valkyrie includes the snarky bat humanoid Preed, the kangaroo girl Stith, the turtle-ish Gune, and the only other human Akima who is a dead ringer for Freefall from Gen 13(aka: Magical Drama Queen Roxy). Their star trek has them running into the Drej who really want to wipe out mankind altogether because they fear their possible evolution, which would overshadow their own. Cale has a special compass in his hand while bearing a special ring that can lead them to the Titan. Aside from the Drej, Cale has to put up with some backstabbing crew mates, with other aliens either helping or impeding his progress. Titan A.E. was important in the field of animation as it was first one to be screened fully in digital cinema, as well as one of the last theatrically released films be done largely in a hand-drawn production. The best feature is the all-star cast of Drew Barrymore, Bill Pullman, Matt Damon, Janeane Garofalo, and Nathan Lane. The flow of the story pads out more like a mid-80s space opera, but does provide some solid originality, including an actually smart security guard! 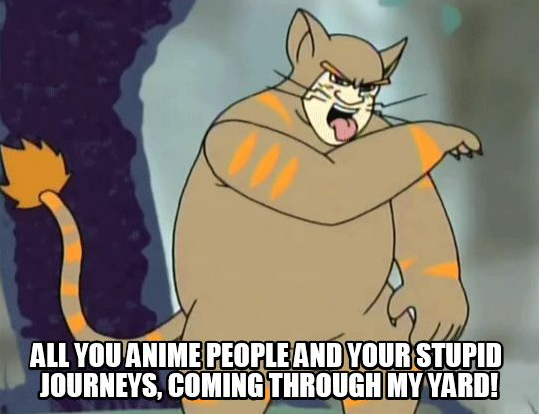 All you anime people and your stupid journeys, coming through my yard! 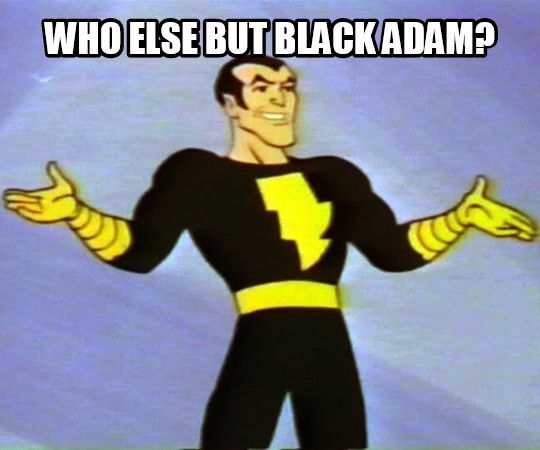 Who else but Black Adam? 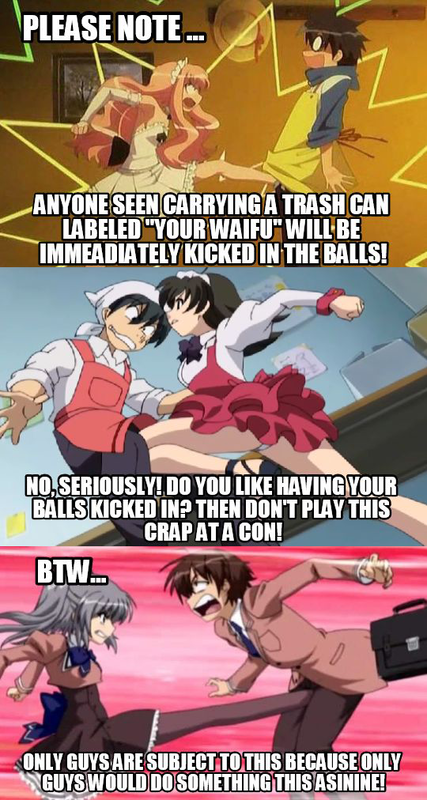 Don't carry trash cans labeled "your waifu"! Very much inspired by the Mexican Luchador films of the 1960s, Tatantula is a one-shot full-color hardcover graphic novel by Ad House Books with some serious anime overtones. Writer Fabian Rangel Jr. and artist Alexis Tritt had worked together before on the trippy Space Riders, and then got together again to collaborate on this grindhouse experience. Set in 1978, scantily-clad masked heroine Tarantula seeks help from her former mentor, Senor Muerte, intending to team up with the masked manhunter known as Sombra. The three amigos unite to uncover a conspiracy between the crystal-headed Dr. Quarzo, the corrupt Mayor Villalobos, and the monkey-controlling Dr. Mandinga in an attempt to conjure up the demonic Penumbra. Help from the masked police detective Santos brings the bizarre clash between the forces of vigilante justice and the gory underworld. Tarantula is a psychedelic voyage into darklight rock posters and exploitation flicks. If you were a fan of gritty Bronze Age anime like Devilman, Captain Harlock, or Gatchaman, this works as a great poke at the unorthodox but creative media during the 70s. 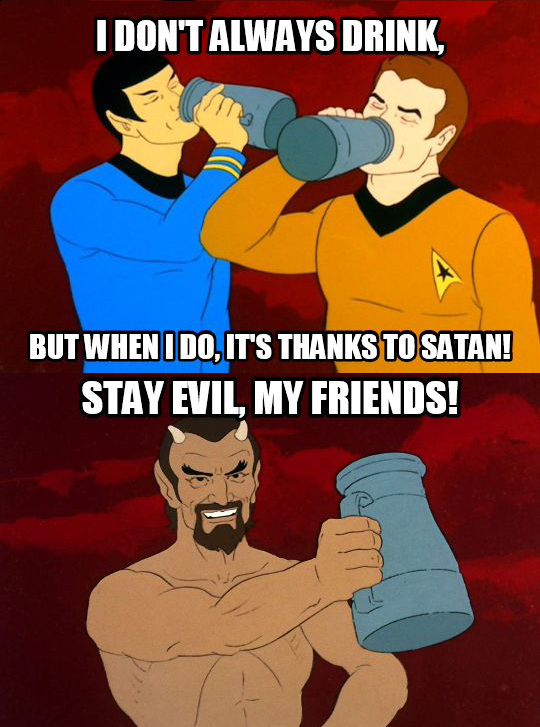 Get drunk, thanks to Satan! In his final performance, Adam West plays the campy 60's version of the Caped Crusader one last time in this special made-for-video movie. Batman Vs. Two-Face shows the premiere of the classic DC Comics villain in the "Dozierverse", although the character was planned for an abandoned episode featuring Clint Eastwood as the divided bad-doer. This time though, he's voiced by William-effing-Shatner, and modeled after the Captain Kirk take used in Filmation's Star Trek, who also did the original Batman cartoon. Set sometime after Return Of The Caped Crusaders, Batman and Robin are asked to witness an experiment conducted by Hugo Strange(with a cameo by his assistant, Dr. Quinzel! ), where he plans on extracting the evil from five of Gotham's worst villains. But the bad guys mojo proves to much for Strange's contraption, which spills out on to Harvey Dent, the local district attorney and Bruce Wayne's old college friend. Harvey now is a living half-Mr. Hyde as the new criminal called Two-Face. After a few crime sprees during the opening credits, Harvey is finally captured and physically restored to his old self thanks to plastic surgery. Despite his insane criminal activities, Dent is allowed to become the assistant D.A., just as King Tut and Bookworm each go on their own heists. Batman and Robin solve both cases, but realize that each caper dealt with duality, pointing to Two-Face being behind the whole thing. After confronting Harvey Dent directly, the Dynamic Duo aren't totally sure if he's the guilty party. Two-Face however emerges, captures them, and ties them to a giant coin. After deducing their true identities, Two-Face gets Hugo Strange to remake his device to transfer the evil from some villains he invited to bid off Batman and Robin's fate. Catwoman breaks out of jail though to rescue the Caped Crusaders, while Two-Face takes the bad-guy formula to spray all over Gotham. With most of the city now transformed into Two-Face versions of themselves, Batman and Robin take down the actual Two-Face, while Batman has a final confrontation with Harvey who is battling between his two personalities. Harvey eventually purges himself from Two-Face, and returns seemingly not knowing the Dynamic Duo's secret identities. 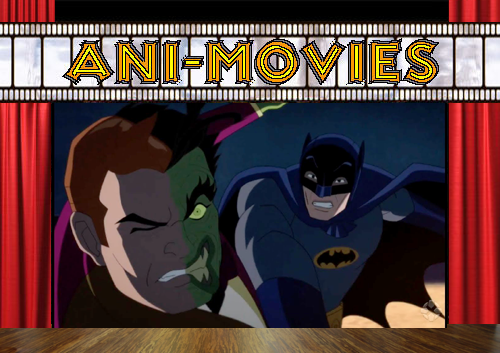 Batman Vs. Two-Face is slightly superior to Return Of The Caped Crusaders as it folds out more like a 3-part TV episode, where as the prior feature was like several comic book chapters bonded to single plot. The original voice actors are back, with Shatner doing a brilliant job as the duplicitous Two-Face, with shades of the mirror universe version of Kirk from Star Trek, also making for probably the most memorable portrayal of the character so far. There's a quick bonus on the Blu-Ray featuring a possible addition to Batman's rogues gallery, although given that there would be no way to produce another Batman '66 feature without Adam West, it doesn't seem likely that this will go anywhere. However, that shouldn't stop you from enjoying this film that honors both the 60's TV series, and the ongoing legacy of the "Bright Knight"!